1. We can pick you/your guest(s) up at the gate.The chauffeur will be waiting with a sign stating the name of the contact person.It is important that we have the passengers mobile number we have contact if necessary. 2. 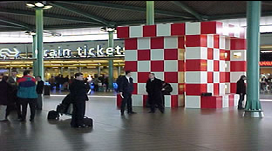 If you/your geust(s)are acquainted with Schiphol then we can meet at Schiphol’s Meeting Point in the main hall at the Airport train station,Schiphol plaza.The Meeting Point is reconized by its red and white sculpture in the middle of the hall. (link to ground plan with red/whith Meeting Point) again,the same applies we will be waiting with a name sign. 3. Ultimatley, we can pick you up outside by the main entrance of the Sheraton hotel.Give us a call when you arrive and waiting for your luggage,call our general number: 0031646221536. 4. We are specialized in transferring your guests to and from the private jets at Amsterdam or Rotterdam jet center (General Aviation). Our drivers will wait for your guests in the lounge or, if permitted, directly at the jet. We are constantly in direct contact with the managers of the jet centers should there be any changes or delays. We provide our most luxury vehicles like Mercedes S class or if you require more space we can provide a luxury Mercedes Viano Minivan. If you would like to reserve, please contact our reservation team by phone or email. At the time of the transfer, the driver will wait at the agreed airport pick-up point for a maximum of 20 minutes from the time the luggage is provided on the belt. In the unlikely event that you cannot locate the driver at the meeting point, or if you are delayed in customs, immigration, baggage collection or lost luggage, it is your responsibility to call the 24/7 emergency number, +31 6 46 22 15 36, to make contact with us. If you fail to call the emergency contact number within 20 minutes from the time the luggage is provided on the belt, and as such the Taxi Amsterdam Airport is not made aware of the problem, the service will be considered a no-show and you accept to pay the full cost of the booked service.